Atop a lush landscape of gently rolling hills, dotted with thick stands of trees, meandering creeks and grassy marshlands, Somerby Golf Club echoes the grace and essence of golf’s illustrious “Golden Age.” Designed by renowned golf course architects John Fought and Tom Lehman, the 18-hole championship course extends from 5,160 to 7,209 yards and features generous fairways. The wetland areas have been integrated into the holes along with several lakes. While the slope and course ratings may seem daunting, the course remains eminently fair. 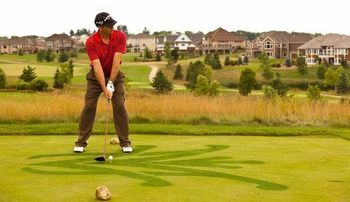 By offering golfers a variety of shot options to safely reach the green, the course is flexible enough for the novice, yet provides enough strategically placed hazards to challenge even the most accomplished golfer. Incorporating natural elements such as shimmering ponds and lakes, fescue-covered hillocks and flourishing wetlands to preserve the native environment, Somerby Golf Club is an experience that one will not soon forget. Golf Digest Magazine consistently ranks Somerby among the top ten best courses in the State of Minnesota. Somerby Golf Club is a prior host of the PGA Tour's Nationwide Series and has also been recognized for excellence in environmental stewardship by achieving the designation as a "Certified Audubon Cooperative Sanctuary" by Audubon International.